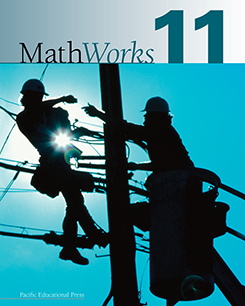 MathWorks 11 Student Resource was created to help students make a connection between what they learn in school and the real world. Each chapter is designed to engage students, build their knowledge, and help them develop reasoning, visualization, communication, problem-solving, and critical thinking skills. Alberta Education Assessment Standards for Mathematic 20-3: This document provides achievement indicators for specific outcomes of the curriculum, as well as standards for assessing individual student achievement relative to the curriculum outcomes. The document provides page number cross-references to the MathWorks 11 Student Resource. Errata: The original printing of MathWorks 11 Student Resource contained the errors found in this document (PDF). We apologize for any inconvenience this may have caused. These errors will be corrected in future printings of the resources.